Abhinav Bindra shows his medal as he stands with silver medallist Zhu Qinan and bronze medallist Henri Hakkinen. Gold medallist Abhinav Bindra of India is hugged by his coach Gabriele Buhlmann after the finals. 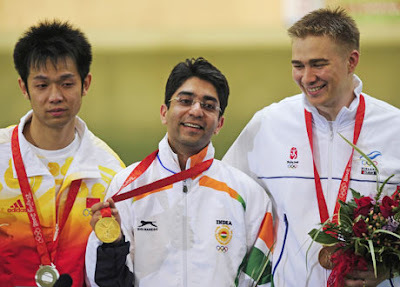 Abhinav Bindra wins gold for India. 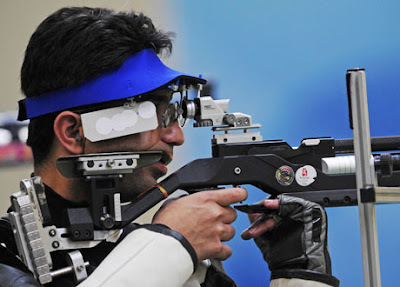 World champion Abhinav Bindra clinched India's first ever individual gold medal at the Olympics, winning 10m air rifle event at the Beijing Games here on Monday. The 25-year-old, who qualified fourth for the event, shot an overall score of (596+140.5) 700.5 in a thrilling finale which went right down to the last shot.